Bible Cartoons: 1 Timothy goes green, with a shipwreck! 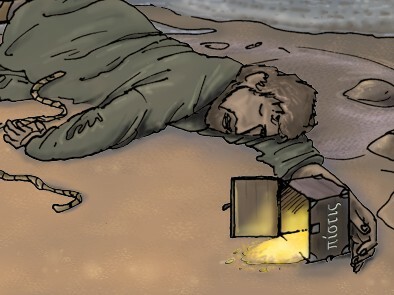 I have just completed my very first Bible Cartoon for the New Testament book 1 Timothy – hurray! Once again that means on the Search by Bible Book page, the previously red box (indicating no Bible Cartoons drawn for that book) has now turned green (indicating that a Bible Cartoons HAS been drawn for that book) – yippee! 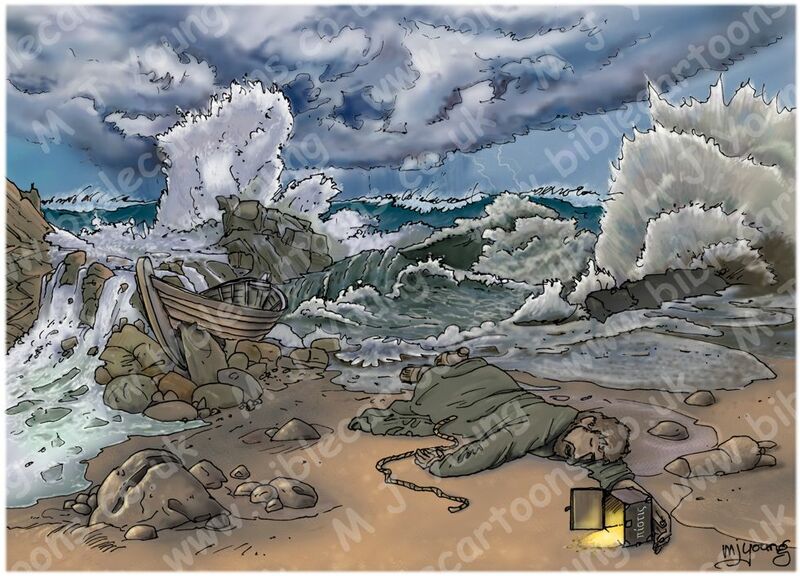 The picture shows a man lying on a storm raged beach, with his boat holed by a large rock. He appears to be unconscious, with an outstretched hand having dropped a wooden box or casket. The box has the word Pistis (Green transliteration) on it, which is the word meaning faith in, & from God. The contents of the box (a glowing, mysterious golden dust or liquid) is pouring out onto the beach & seeping into the sand. That signifies the shipwrecking of the man’s faith. Quite a tragic illustration really! Close-up of the man & casket. The apostle Paul was warning the young pastor Timothy in his letter, not to forget his faith & not to forget the prophesies Timothy had received regarding his own faith; keep a good conscience. Even though this was early on in the Christian church (mere decades after Jesus had died & been resurrected) already the Devil was hard at work, bringing confusion, doubt & error in thinking to people, so that they “shipwrecked their faith” & fell away from the gospel of Jesus the Christ. We all have to be vigilant & careful to hear what God is saying & to correctly interpret the Word of God, so as not to shipwreck our own faith. Below are several versions of the same passage from 1 Timothy, for you to read & compare. 18 Timothy, my son, here is my word to you. Fight well for the Lord! God’s preachers told us you would. 19 Keep a strong hold on your faith in Christ. May your heart always say you are right. Some people have not listened to what their hearts say. They have done what they knew was wrong. Because of this, their faith in Christ was wrecked. 20 This happened to Hymenaeus and Alexander. I gave them over to Satan to teach them not to speak against God.